Keep your battery well maintained! 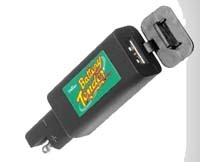 BTP-1: The Battery Tender Plus is a 1.25 amp battery charger designed to fully charge a battery and maintain it at proper storage voltage without the damaging effects caused by trickle chargers. Included is a quick connect harness for hard to reach areas. 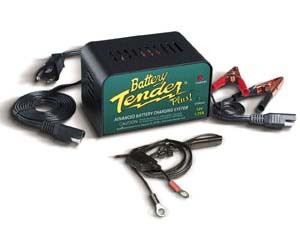 BTJ-1: The Battery Tender Junior is much more than a trickle charger. It has a brain. It's lightweight, compact, and fully automatic; very easy to use, especially in small spaces. It will keep your battery fully charged so that it is ready to go when you are! 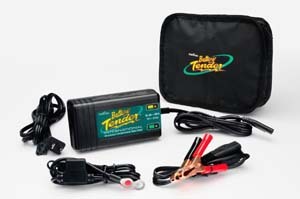 BTW-1: This compact 800 mA battery charger has all the charge characteristics of its cousin the Battery Tender Junior. It incorporates highly efficient surface mount technology electronic components. The interior is completely encapsulated, protected from shock, vibration, and moisture by an electrically insulating, thermally conductive, flame retardant, UL recognized, synthetic epoxy resin compound. It's tough, affordable, and a strong, innovative battery charging solution. This charger is no larger than a standard computer mouse yet packs 800 millamps of pure constant current charging power. Coupled with a brain (IC chip), the charger will constantly monitor, charge, and then maintain your battery --- even while totally submersed under water! International universal input voltage works anywhere in the world 100-240 AC Volts 50/60 Hz. 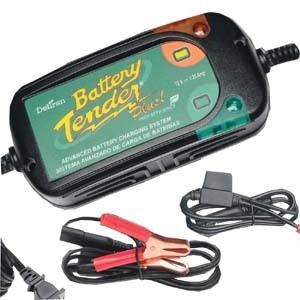 BTI-1: The popular Battery Tender is now offered internationally! The world's most advanced battery charger switches automatically from charge to long term storage. International Input Model (Worldwide Usage). Voltage Range 100-240 VAC 50/60 Hz. 12 volts @ 1.25 amps. Switchmode Design- Lightweight & compact (1 lb.) (,45 kg). 4 step fully automatic charging (Initialization, Bulk, Absorption, Float/ Maintenance). Microprocessor Controlled Constant Current Charging! (Never shuts off while monitoring state of charge). 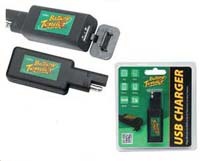 Charges as fast as a 3 amp taper charger! Perfect for all AGM (absorbed glass mat) gel, sealed maintenance free and flooded batteries. 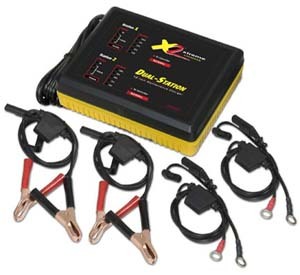 PTI-X2: Xtreme Charge® 2-Station Pulse Maintenance Battery Charger independently monitors, charges and maintains two 12-Volt lead-acid batteries simultaneously. You don't need two chargers, two pairs of hands and two AC outlets to do the job! 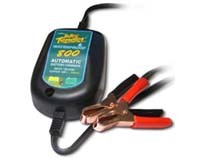 This unique 12-Volt charger can also be used for many 24-Volt commercial systems composed of two 12-Volt batteries connected in series, including generators, transit and charter buses, heavy trucks, fork and scissor lifts and more. The sealed design can be used outdoors. BTQ-U: To charge iPhone, iPad, iPod, GPS, Camera or any Smartphone or device that can be charged on the road via USB Designed for use on any 12v battery Input: 12v Output: 2.1A Maximum. BTQ-USB: Dual Port USB charger. Smart fuse for surge protection. Use existing USB charge/sync cable for charging (not included). Input: 12-24V. Output: 2.1A for iPad/tablets and 1A for cell phones. BTQ-VI: Plugs into QDC battery harness. Three LED lights indicate state of charge. LCD displays battery voltage. 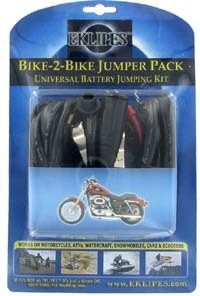 JC-41: The New Patented Design Universal Bike-2-Bike Jumper Pack is like no other Jumper Cable System in the World! 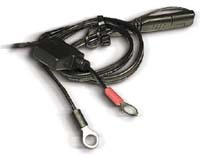 5ft Bike-2-Bike Jump-Start Extension Cable with 2 Male Plugs. 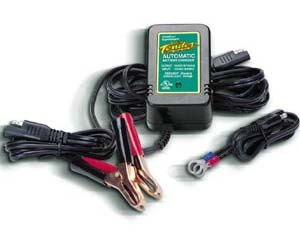 For the first time ever, you can jump-start one vehicle from another by plugging directly into the Battery Harnesses! (NO MORE ALLIGATOR CLIPS, NO MORE HASSLE!) Also included is our 2’3” Battery Terminal Alligator Clips with Female Plug (Just in-case the other vehicle does not yet have our Battery Harness.) Water-proof Caps included.